Antonio “Bigfoot” Silva will end his nine-month testosterone suspension against former UFC heavyweight champion Andrei Arlovski on September 13. According to Brazilian outlet Combate, the 265-pounders will headline a UFC Fight Night card in Brasilia. A specific venue has yet to be announced. Despite being granted a therapeutic use exemption for testosterone replacement therapy in December’s instant classic against Mark Hunt, Silva still tested positive for elevated levels of testosterone following the shootout. Silva’s win was subsequently overturned to a no contest, tarnishing one of the most epic bouts in MMA history. 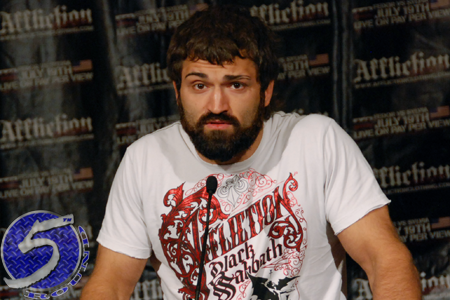 “Bigfoot’s” suspension expires five days before his rematch with Arlovski. Silva holds a 2010 unanimous decision win over Arlovski from their time together at Strikeforce. Arlovski made a triumphant return to the octagon last month with an admitted lackluster split decision victory over Brendan Schaub. “The Pit Bull” will be riding a three-fight winning streak into the tango. No other bouts have been rumored for the lineup at this time.